What does your morning routine look like? When you wake up, perhaps you reach for your phone and thumb through your notifications. You’re not alone: 61% of cell phone owners check their phones within five minutes of waking up. Or maybe you go to the bathroom, turn on the faucet and splash warm water on your face. Next comes the kitchen. You put a pan on the stove, grab some butter from the fridge, turn on the gas and in just sixty seconds you can crack an egg over the bubbling grease. A hundred years ago, none of this would have been possible. The cell phone is obvious, but the others are less so. Hot and cold running water was not widely available in the U.S. until the 1960s; even in 2015, 1.7 million Americans lived without running water. Electric stoves started to take off after the 1920s and refrigerators, once a luxury of the upper classes, became a regular household feature only after World War II. In other words, there are a hundred acts of magic that happen in each of our lives every day. 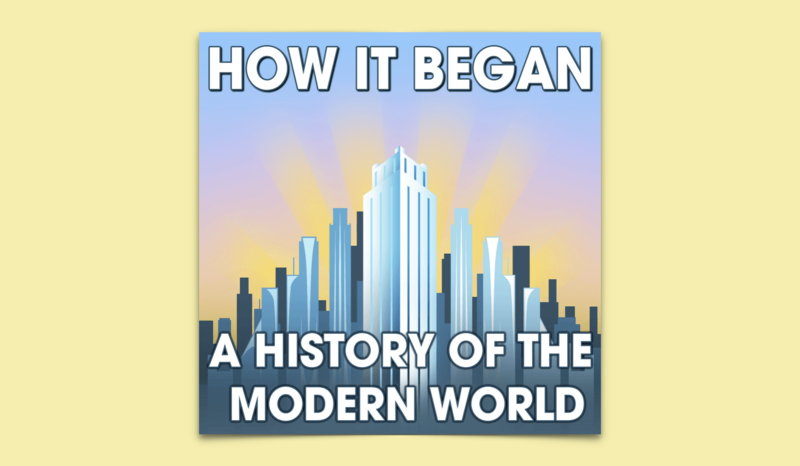 This magic is what historian Brad Harris wants to call our attention to in his podcast How It Began: A History of the Modern World. In each episode, Harris highlights a mainstay of modern-day life such as coffee, computers or the stock market. From these dauntingly large starting points, he manages to winnow down books worth of research into digestible 30-minute or hour-long histories. It is masterful. Harris’s research skills are well-honed. He earned a PhD in the history of science and technology from Stanford, where he wrote about subjects like how the cigarette filter was invented to rebrand smoking as healthy and how plastic production forever altered the modern economy and the environment. (A remarkable fact from his research: Americans produced more plastic from 2000 to 2015 than we did in the entire 20th century.) Harris applies his academic training when podcasting. To write one episode, he will read up to a dozen books on the topic and at least as many articles. When that isn’t enough, he gets in touch with experts in the field. As one might imagine, the scripts are rich with information and elegant turns of phrase. In the episode about coffee, for example, Harris tells us that coffee sits just behind petroleum as the world’s most valuable traded commodity, with 500 billion cups sold a year. He writes, “These two black fluids suffuse the very veins of modernity, oil fueling our machines and coffee fueling our minds.” In addition to being well-written, How It Began is also well-spoken. Harris’s voice is deep, crisp and reminiscent of movie trailer narrators. His sense of timing and phrasing make it easy for the listener to process what could be an overload of information if handled by a lesser voice. That voice is important because, with the exception of one or two episodes, there are very few sound bites from historical archives and no interviews with other historians. Harris’s only accompaniment is the ambient music that plays through the duration of each episode. Though the tracks are different every time, the music is always cinematic and always carries a sense of urgency. Its energy keeps the listener’s brain awake and focused on Harris’s words. Listen to enough episodes and your eyes become wiser; you start paying attention to the dozens of objects that you interact with in a day, and you find yourself thinking about the hands and minds that made them, and the planes and trucks that carried them to you. It’s like switching your vision from black and white to HD color. In one of the most engrossing episodes, “Wolves to Dogs,” Harris takes us through the 35,000-year story of wolves’ domestication. His episodes follow a format. There’s an introduction that whets our appetite for the subject with a number of questions. For this episode, they include: “How can a purse-traveling Pekingese and a Special Forces German shepherd descend from the same stock?” and “How did we ultimately earn such protective friendship from what had long been the fiercest phantoms of our nightmares?” Next comes his signature tagline, which marks the end of the intro: “I give you wolves to dogs, and how it began.” Some listeners might find Harris’s podcasting style to be overdone. Indeed, lines like this have the potential to come off as corny, and sometimes they do. In general though, the theatrical approach underscores Harris’s point that what is mundane to modern man was dramatic to our ancestors; many of them even sacrificed their lives for the sake of progress. After the intro, each episode walks us through a clear and chronological telling of events. Harris balances dates and facts with diverting storytelling techniques that allow our minds to time travel. In the dogs episode, the anecdotes span a vast stretch of history from 26,000 years ago to the 1950s, from an ancient set of footprints that show a boy and a dog walking together to a Cold War-era Soviet experiment. In the latter, geneticist Dmitry Belyaev domesticated silver foxes. In less than 30 years over 40 generations, the foxes developed floppy ears, curved tails and a love of cuddling with humans. Wolves did not domesticate as quickly as Belyaev’s foxes but the impact of their domestication on human civilization was significant. They became humans’ hunting companions and allowed our ancestors to domesticate other animals like goats, sheep and pigs. When this happened, humans found themselves with an excess of food for the first time in history. But, as Harris puts it, “excess food means excess wealth.” Domesticating wolves, he argues, helped people stratify their societies and create classes. The episode is illuminating in today’s world of Instagram dogs, doggie day cares and movies like Best in Show. Whether discussing dogs, refrigerators or skyscrapers, Harris gets us to slow down and look deeply at our surroundings. He asks us to savor the aesthetics around us and most importantly, to be grateful for these modern conveniences. History tends to be a harrowing subject, but How It Began presents an optimistic side. Today, especially, there is value in taking an hour out of the day to remember that humans are capable not only of extraordinary deeds but of good ones too. Next PostWhere Are We Headed with Fiction Podcasts?